Back bacon, the kind of bacon you'll usually find in Ireland and Great Britain, is cured pork loin with a bit of the side bacon attached. The cut sets it apart from standard American bacon, which comes from the belly. 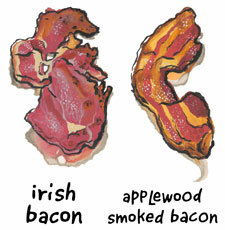 About twice as wide as American bacon, it's very lean, lightly smoky, subtly sweet. My English expat friend Jude calls it “proper bacon,” since it's the kind she grew up with. It's made in Chicago by another expat, Nick Spencer. He hand trims and dry cures this pork loin in small batches, selling it primarily at farmers' markets. Back bacon is not only great for breakfast, but also in sandwiches or diced and dropped into omelets. If you know someone from Britain or Ireland, this would make a great gift.